Nearly thirty years after race riots had wracked our family’s West Garfield Park neighborhood of half a century, Mom had died, just five years after Dad’s death in 1989. Readying our former home for sale, my two brothers and I scoured the house, separating trash from treasure. In the attic, we found our gold. Standing under naked beams in the dim light, we discovered a large box labeled in my mother’s neat printing: “Lil and Fred’s Letters and Diaries.” I ripped off the packing tape and folded back four cardboard flaps. A misty spray of dust and the odor of old paper wafted up. Peering in, I dug out several small books, the oldest dating to 1927—a diary Mom had started at age ten. Flipping through the pages, I recognized in her youthful handwriting the fledgling swoops and curves of the adult script I knew so well. Intermixed with Mom’s diaries were ten years’ worth of Dad’s journals. We pulled out bundles of letters, neatly secured with string, each with a label: “Fred’s and Lil’s Letters, 1949,” then “Fred’s and Lil’s Letters, 1950,” and so on throughout Dad’s thirteen years of travel. Digging deeper, we found a parchment-wrapped package, bound with pink ribbon tied into a bow, like a present across the decades. On the wrapping, Mom had written: “Greeting Cards Between Fred and Lil, 1942–1949,” then another, “1950–1953,” and several more multiyear packets. Farther down were Dad’s annotated daily calendars from the sixties through the eighties, and Mom’s seventeen spiral notebooks, with detailed entries of increasing chaos on the West Side and her rising fury at my father. We moved on to Grandma Gartz’s cedar chest, which had come to be stored in our attic after she and Grandpa had died. It was filled with letters, diaries, documents, and photos spanning the twentieth century. “Listen to this,” one of us would call out in astonishment. Then all paused as a line from a letter or journal entry was read. Our ancestors’ pack-rat traits, once an object of our head-shaking bemusement, infused our attic labors with amazement and joy. For a solid week we tossed, culled, and pondered what to keep. After filling a Dumpster with the useless and unsentimental, we stored twenty-five bankers’ boxes of our treasures in my garage, where their secrets lay silent, like the contents of an ancient, unopened tomb, as I got on with the business of life and family. For decades, I had puzzled over what had caused the demise of my parents’ marriage—Mom’s hurtful recriminations against Dad, followed by his wounded retreat, their rift reducing me to tears. And what of the downfall of our community, where Dad’s parents had lived for half a century, raised three sons, and bought property, the apogee of the American dream? At the time of increasing turmoil between my parents, coinciding with the racial upheavals on Chicago’s West Side, I had been a teen and a young adult, with no context for the strife in my home or on the streets. But now, a nagging inner voice echoed in my head, luring me like a siren song: the archives might hold clues, answers. I finally gave in, hauled out one box after another, and began reading: my grandfather’s 1910 journal of his daring journey from Transylvania to America; diaries from Dad’s and Mom’s youth, revealing their inner thoughts and passionate courtship; court records and diary entries of my maternal grandmother’s psychosis; letters between Dad and Mom during his thirteen years of grueling travel; Mom’s diaries of their twenty-year-long effort to maintain quality buildings in a riot-riven landscape and her downward spiral into bitter rage; her vicious attacks on Dad, his parents, and me, a participant in the 1960s sexual revolution. The archives blazed light onto long-hidden family secrets, but to understand what had happened to our community, I needed more, so I devoured everything I could find about racial change in American cities. I learned that our family’s fate on Chicago’s West Side was entangled with racist mortgage policies and predatory real-estate agents, which together undermined the housing dreams of both blacks and whites. 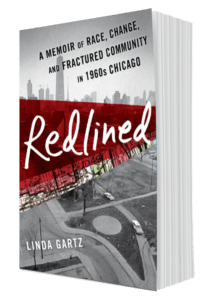 Within the story of our family’s presence on Chicago’s West Side throughout most of the twentieth century lies a larger truth that is still playing out today in the segregation that costs Chicagoans billions of dollars each year and grows the homicide rate. This is also my story—of growing up in a sprawling West Side rooming house filled with wacky tenants and my live-in delusional grandmother; of seeing Mom manage alone while Dad traveled for weeks at a time; of my quest for independence just as America exploded in the social revolutions and racial upheavals of the 1960s and 1970s. But it was my dismay at the unraveling of my parents’ marriage that prompted my search for answers in the family archives. These treasures, which had lain in the dark for decades, now illuminated the path that led to domestic collapse, from the ravages that mental illness wreaks upon families to the insidious role parents can play in undermining the marriages of their children. With the civil rights movement as backdrop and a crumbling marriage in the foreground, this story tries to make sense of the racial transformation of our Chicago West Side community and its impact on our family dynamic, also formed by love, loss, madness, race, rage, and, ultimately, forgiveness.